Just a week on, Herne Hill is getting back to normal but for 35 businesses it’s going to be a long haul. An eagle-eyed resident spotted the water swelling through the concrete around midday on Tuesday 6th August. He noticed the seepage was getting worse so he called Thames Water around 12.30pm who logged it as a repair to be done within 3 days. The company agreed to dispatch an engineer within three days, but tragedy struck when the main burst less than 24 hours later at 5am on Wednesday 6th Aug.
For photos and news of the flood last week please see the post here….. 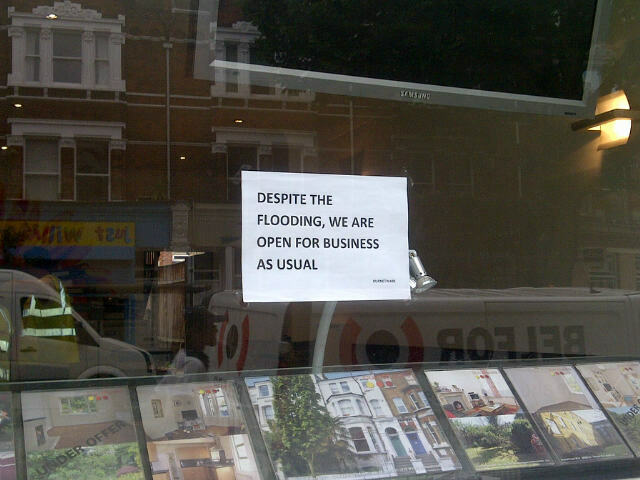 The Lambeth side of Herne Hill is open for business with Southwark bearing the brunt of the flood. The ensuing flood affected 35 businesses and two residents. Thames Water and Southwark Council have been working hard to restore services and help businesses and residents affected. The broken pipe has been replaced and work is in progress to repair the roadway and pavements, with estimates that Half Moon Lane will be reopened sometime next week. Text “Halfmoon” to 80007 for updates from Thames Water. Further details are on http://www.southwark.gov.uk/news/article/1316/herne_hill_flooding-7_august_update and http://www.thameswater.co.uk. Half Moon pub – being assessed. Other shops are being cleared out for drying and refitting. Questions are being asked as to why Thames Water was unable to check the flow pressure in the pipes when the problem was first logged. We are seeking answers and will report back. The burst main was a 36″ cast iron main installed in 1925. The main broke and fell away downwards. The pressure of water from the broken main washed away the soil and grit bursting through a hole into the road and carrying the soil debris with it as it flooded Herne Hill, hence all the dirt on the roads. While Thames Water have a number of monitoring systems looking at the whole water system, it was not possible to identify centrally any serious flow problems at this point. It would have required a visit to the site, and had the pipe not burst engineers would have attended with equipment to trace the leak. The broken main has been sent to forensics to establish the cause of the breakage. London Fire Brigade Silver Command were in charge on Wed 7th and handed over overall charge to Thames Water later on Wednesday. The first priority was safety. A lamppost collapsed and electricity had to be isolated. A tree was also on top of where the ground had been washed away so the tree was removed. TW also had to check the sewers had the capacity to take water pumped out of basements. The basements were first checked to ensure no one had been trapped, and then the basements were pumped out. and water discharged into the gullies and main sewer. Once the site was safe and environment under control, work started on replacing the pipe. The new spun steel pipe has now been installed. The reconnection of electricity has been quite an exercise which TW co-ordinated. UK Power Networks reconnected the electricity; new meters and distribution boards had to be installed by the suppliers, followed by certification between the various parties. Residents above the shops were the worst affected through loss of electrics, and they were put up in hotels by Thames Water. The last properties to be reconnected were due to be done today. Half Moon Lane will be fully open on Bank Holiday Monday 26th August with partial reopening from Herne Hill to Stradella earlier. Previous Previous post: Extensive Flooding in Herne Hill – 7th August 2013 (photos). Thoughts with traders and residents. 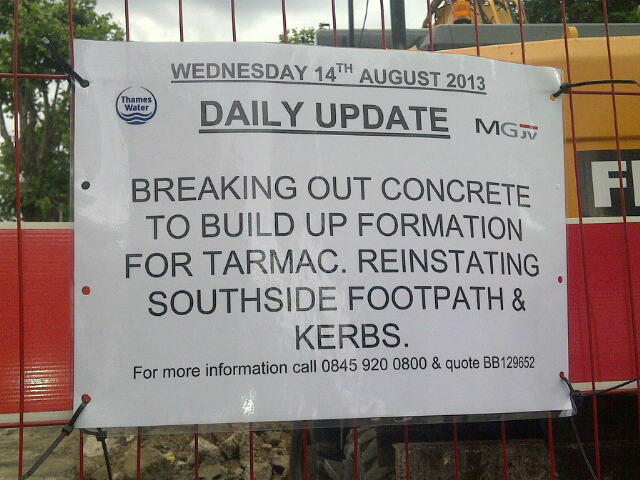 Next Next post: Herne Hill Flood – Latest news; Carver Road j/w Half Moon Lane reopens; Trader updates 20 August 2013.